There are dozens of different grouper sub-species, ranging in size and color. 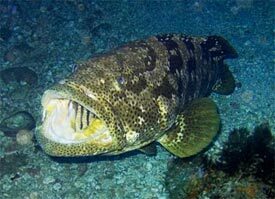 All varieties of grouper, however, share the same two traits: large eyes and and a large mouth. Depends on the species of grouper. 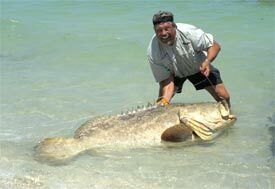 The biggest is the aptly name goliath grouper, with the IGFA world record being 680 pounds (308.44 kg). Yellowfin grouper, one of the most common targets among groupers for anglers, can grow to be over 40 pounds (18 kg). Groupers are most commonly found in southeastern United States, especially around Florida. Different species can be found closer to Texas and as far south as Brazil. Groupers are ambush hunters and so find whatever cover they can to keep out of sight. Caves, reefs, shipwrecks, and any other kind of structure along the bottom of the ocean they can find. Henry Waszczuk with a giant goliath grouper. Groupers are opportunistic hunters that feed on a variety of different fish and crustacean. Similar to all groupers are its feeding technique: by opening the mouth and rapidly dilating the gill covers to draw in water, groupers can generally engulf prey whole.The bigger the grouper the more likely that fish is the main diet, although lobsters and octopuses are on the menu as well. Many subspecies of groupers are protogynous hermaphrodites, meaning that they begin their lives as females before changing into males. 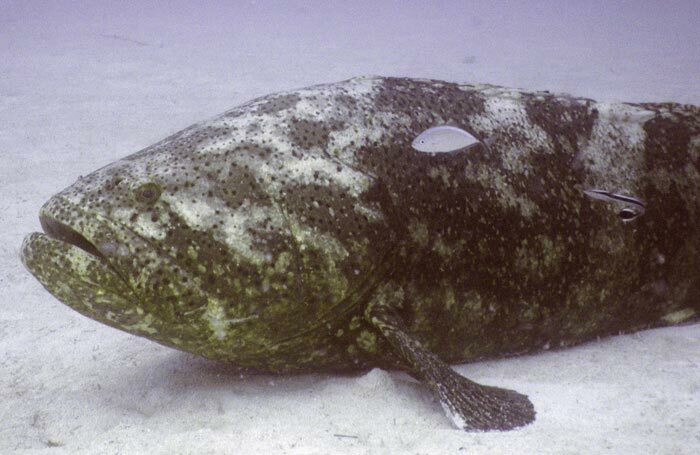 The change occurs anywhere between 5-10 years, often a result of weight - the bigger the grouper, especially if nearby groupers are smaller, the more likely it will change. pawning takes place between May and August. Some of the bigger groupers have very few natural predators, but sharks, moray eels, and barracuda have been known to feed on groupers. Information above courtesy of the U.S. Geological Survey. When it comes to fishing - especially deep sea fishing - few trips will be as memorable as going after grouper. These huge fish make grouper fishing a real treat, even for the beginner. They are a very large fish, and you will need to be very strong if you plan to reel one in. The cold fact of grouper fishing is that you are just as likely to lose as you are to win. There are different methods of grouper fishing that people use, one of the most popular being trolling. When you are trolling for grouper, you are simply in a slow moving boat, letting your line trail behind the boat as you drive through areas that the fish inhabit. Those who fish for grouper in the Gulf of Mexico will often employ magnum diving plugs to help that lure descend far enough down to get a grouper's attention. By trolling the edges of reefs and rocks, those in the Gulf are able to get a grouper's attention. In the Southern parts of Florida, the game is a little bit different, with the boat waiting near a reef where the grouper will hide and wait for prey. Once the fish strikes, the boat moves away, dragging it away from the reef where the sharp coral and rocks can cut the line. There is also a style of grouper fishing that is known as bottom fishing. At least 50lb test line is definitely needed for this approach because these fish are heavy and can fight. This technique uses fish finder rigs that employ a hefty sinker to get the line to the bottom. The bait used in this situation is usually cut bait and chunks of squid are a popular choice. Since this helps reduce the number of snags, a boat's captain is likely to show this method quite a bit of favor since it will save them time and money. The third and final method of grouper fishing is to use live bait with a sliding egg sinker. A long leader of about 6 feet is generally chosen and preferably a fluorocarbon line, since that is a lot harder for these keen fish to notice. Usually, they take the hook and head straight for home, so anglers need stay alert so they can set the hook and pull the fish away from cover. A grouper is not just one species of fish, it is actually a whole family of different fish that are long sought after by those who like to fish in salt water. This is one of the larger fish out there and they can get anywhere from 30 lbs to over 300 lbs. This means that if you plan to fish them, you had be ready for a seriously large predator that is not afraid to eat just about anything that gets in its way. They have even been known to swallow small sharks, so it needs to be understood they are not all that picky about how they feed. If it moves and it is smaller than them, then they are very likely to go ahead and swallow it if they can. They tend to be solitary fish and do not go about in schools. The fact that they are alone means that they will prefer shelter so that they can wait and watch for the prey to pass buy them before darting out to chomp it down as quickly as possible. However, with their large chunky bodies they are not fast swimmers over a long distance. They rely on surprise to earn their meals. They also do not chew their food, even though they do have teeth. Instead of tearing off chunks, they prefer to swallow the entire prey animal and then crush it to death with what are called 'teeth plates' located towards the back of their mouths. These fish have a very high class diet of lobster, crab, octopus and other fish, depending upon where it is that they live. They are also known in some places to accompany the moray eel when hunting, some species working together to try and get a bite to eat. Where Can You Go Grouper Fishing? 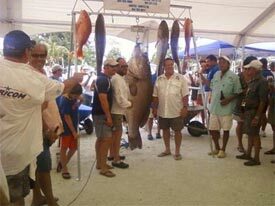 Grouper fishing is very popular and these days it is possible to go after these fish in several different places. Gulf of Mexico grouper fishing trips are definitely a popular way for many who pursue these fish to get in some time doing their favorite past time. There are grouper around Bermuda, Trinidad and other tropical Caribbean islands as well, and these are some impressive fish. Florida is the most popular place in the United States for those who want to fish for grouper, but understanding the grouper fishing regulations is definitely quite key. Many areas around the world do not allow fishing for certain species of grouper, and other areas allow a catch and release only fishery. These fish are found around Africa, Australia and many other parts of the world. In the Philippines they are prized, but it is perhaps the Persian Gulf where 'hammour' is enjoyed, that these fish are considered a real meal that is to be savored. What Do You Need to Do Grouper Fishing? It is definitely important to have first and foremost a boat because this is the best way to get at grouper and have your choice of spots from which to fish. You will need a charter captain who knows his or her way around the reefs, though, because that is where these fish are most often going to be found. Having the right grouper fishing rigs ready to go is definitely important because these are fish that require a strong line, but not so strong that they can visually see it and try to avoid it. That will not get you too far with a grouper since they are highly likely to try and avoid your line if at all possible, being naturally shy and cautious fish. In addition, having the right kind of bait to interest them is quite helpful. Some prefer to use live bait and this can work, but cut bait will work just as well. If you choose to make use of the feathering technique that is very distinctive and tends to remind one of a set of octopus or squid legs, you may be able to pass your bait by the grouper and have him go straight after it. It is said that these fish are not all that hard to interest, especially if they are already feeding, but it is getting them to the boat that is the real battle since they will stubbornly stay where they are and try not to come out if they can avoid it. Once you take the time to study the grouper fishing tactics, though, especially if you do so with an experienced angler who knows grouper, you will discover many small grouper fishing tips that can help you advance your skills. Once you have the passion and the right equipment, all you need are the grouper fishing techniques that match your strength and skill level in order to be a success at this type of marine fishing.